For everyone else — if you want to easily switch between different versions of Elixir (and Erlang) for different projects: keep on reading below. What do you do if one project needs Elixir 1.7 while another needs Elixir 1.3 How do you switch between versions of Elixir and Erlang? I suppose we could manually uninstall and re-install different versions when moving between projects, but that sounds tedious, unproductive, and downright confusing for all involved. There must be a better way… right? asdf lets us easily install and manage multiple versions of almost any language (Node, Ruby, Elixir, Python, etc.). We can even tell asdf to use different language versions for different projects. Very nice. By the end, our system will be set up to use the latest versions of Elixir and Erlang by default (called the global scope) and we’ll have a project that will always use Elixir 1.3.4 (even on other people’s machines if they use asdf!). But first… we need to install asdf. Let’s get started! If you get a command not found error, install homebrew using the command found here. Now that asdf is installed, we’ve got to add it to our shell path. Now just restart your Terminal and you should be done! Hopefully, you’ll get back v0.6.2 (or whatever the latest version is). Done! Skip past the next section (installing asdf on Linux) and move onto the second chapter: installing the Erlang & Elixir plugins for asdf. If you get a command not found error: download Git and restart your Terminal. Now that asdf is downloaded, we’ve got to add it to our shell path. If you’re using zsh or fish, have a look at the end of the Mac section above. It contains the commands needed for appending asdf’s path to your zsh or fish config file. Hopefully, that’ll return something like Updated asdf to release v0.6.2 (or whatever the latest version is. If not, check you’re using the right shell and have followed the previous steps correctly. If you can’t figure it out after some googling, post a comment down below and I’ll do my best to help out. Since we’ve installed asdf manually using Git, we should install some packages (as recommended by asdf) to make sure we’re not missing any plugin dependencies. Next up, let’s install Elixir and Erlang using asdf. But Daniel, why do I need Erlang if I just want to use Elixir? Great question. Elixir is built on Erlang and therefore Elixir code is run inside Erlang’s BEAM VM (Virtual Machine). So we’ll need Erlang if we want to compile and run Elixir code. Different versions of Elixir require different versions of Erlang (you can find a handy table of which versions are compatible on this page). So we can’t just download one version of Erlang and be done with it. Instead, we’ll use asdf to manage our versions of both Erlang and Elixir. Done! Now that asdf knows how to manage Erlang and Elixir, we can start installing them. The answer’s pretty simple: it’s the version of Elixir that Stephen Grider uses in his (fantastic) Elixir & Phoenix Udemy course. 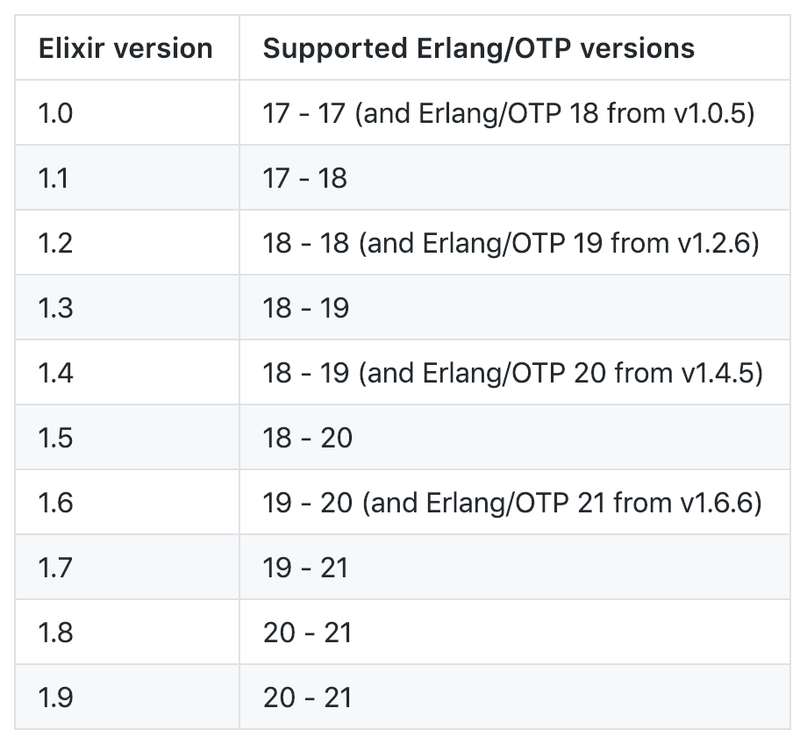 According to the table above (found on this page), Elixir 1.3 requires Erlang 18 or 19. Now try running elixir -v in Terminal. Why doesn’t it work? So far we’ve installed asdf, installed the Elixir and Erlang plugins for asdf, and installed Elixir 1.3.4 and Erlang 19.3… but we haven’t actually told asdf what versions of Elixir & Erlang to use. What if we installed ten different versions of Elixir? How would asdf know which one to use? So next, we’ll explicitly tell asdf which versions of Elixir and Erlang to use. We’ve told asdf that we want to use Erlang 19.3 and Elixir 1.3.4 by default (globally). That’s what the global part of the command is doing. Any time we run an Elixir or Erlang command, asdf will look for a .tool-versions file in our current directory. If that file doesn’t specify an Elixir or Erlang version (or if the file doesn’t exist at all), asdf will use our global default. Right now, our global defaults are set to: Erlang 19.3 and Elixir 1.3.4. Now let’s test that it worked. Perfect. You’re now ready to get started using Elixir 1.3.4. 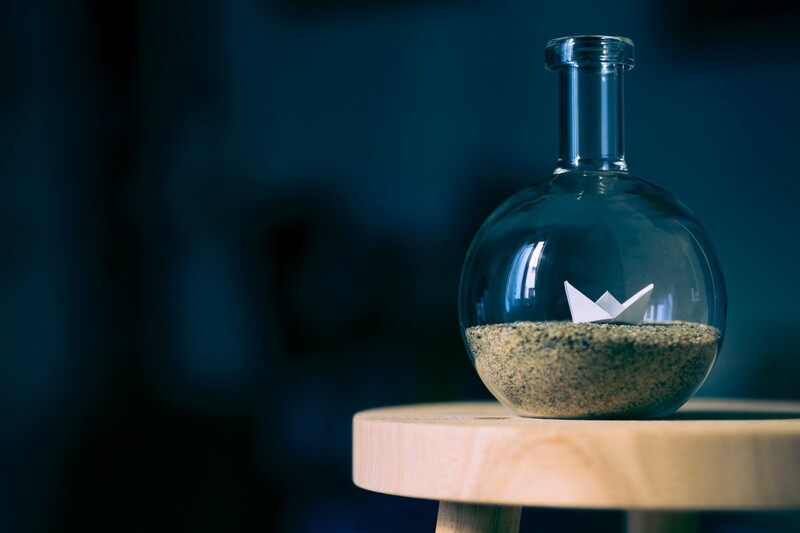 So let’s test it out by creating a new project. If all of your tests passed (all 1 of them haha), then congrats! Our new project is set up. But what would happen if you changed your global Elixir version? Great question. We’ve created this project with 1.3.4, but what happens if we need to change our global version for a different project? Would we always have to run asdf global elixir <version> when switching projects (and do the same for Erlang too?!?). So what did we just do? We told asdf to create a file called .tool-versions (this goes in our project file) which keeps track of what language versions a project should use. What does that .tool-versions file contain? If a project doesn’t have a .tool-versions file, or if a version isn’t specified in this file, asdf will use the global version that you set. But wait, earlier we set our global Elixir version to 1.3.4, right? So does the .tool-versions file we just made even make a difference? We’re still using Elixir 1.3.4 either way! But we’re still using Elixir 1.3.4 both locally and globally. Let’s change that in part 2 by installing Elixir 1.7.4 globally! Now we have one item left on the todo list: install Elixir 1.7.4 (and Erlang 21.1) globally. Click here to learn how to do that in part 2.